There's more to the ketogenic diet than butter, oil, and avocados. 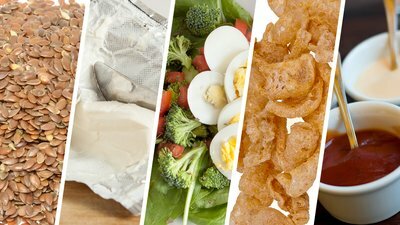 Expand your grocery list with these 5 keto-compatible foods! In the early days of a ketogenic diet, it can easily feel like you're in hog heaven. Bacon, cream, butter, avocado, whole eggs, fatty nuts—they're all on the menu. But delicious as those items may be, they're not enough to build a nutritional life for the long term. You need options! In fact, one of the biggest ketogenic mistakes people make is not having enough variety in their diet and getting burned out on the same few foods each day. Without a varied diet, it can end up being be difficult to get enough calories, even on a diet built around calorie-rich foods. Luckily, there are plenty of foods available for you to enjoy on this popular diet, including a few you may not have considered. Put these five items in your keto cart—you won't regret it! A tablespoon of this velvety spread provides 5 grams of fat and less than 1 gram of carbohydrates. For an easy 50 calories, consider adding a dollop to your morning omelet, or include it in your chicken-bacon lettuce wraps! But this comes with a big caveat: Most cream-cheese varieties you find in a grocery store aren't going to be keto-friendly. Make sure you select full-fat, plain cream cheese, and double-check the ingredients. All flavored varieties—and even some unflavored ones—will have some form of sweetness or carbs added, either by the name of sugar, dextrose, cane syrup, or something else entirely. Those are definitely off limits. These tiny seeds provide next to no net carbohydrates, and the few grams they do provide are made up mainly of insoluble fiber, also known as prebiotic fiber. So while the ketogenic diet can do great things for the outside of your gut, these will also do a good turn for the probiotic organisms living in your gut. What's more, these tiny nutrient powerhouses are rich in health-hiking omega-3 fatty acids. Chia seeds are actually the highest known plant-based source of omega-3s. So what do you do with them? Flax and chia seeds can be tossed in drinks or shakes to add a quick nutrition and fiber boost. However, flax seeds are probably best ground before eating, because your stomach likely isn't up to the task of breaking down their hard exterior. Regardless of your nutrition approach, you'll absolutely benefit from eating more vegetables. Look around online, and you'll find lists of certain vegetables that are considered off-limits or occasional-at-most in ketogenic diet. Onions and carrots, for instance, have their detractors. Potatoes and other root vegetables are better left for a different diet entirely. But in keto, leafy greens can be your best friends. Kale, spinach, bok choy, and Swiss chard are all excellent high-fiber, high-nutrient, low-carbohydrate vegetable options that pair well when sautéed in butter or coconut oil and arranged under a fatty piece of meat. But that's only one way to prepare them. If you're looking for an easy way to meet caloric benchmarks and get enough fat, it's hard to beat a salad. You know the classic Cobb salad with hard-boiled egg, blue cheese, and bacon on spinach or lettuce? You can easily make a keto version with those same ingredients, along with nuts, avocado, and a carb-free cream- or mayo-based dressing. Furthermore, both broccoli and cauliflower can also be made into a versatile low-carbohydrate, keto-friendly version of rice. Another favorite among keto aficionados is cauliflower "mash." Just season chopped cauliflower with salt, pepper, paprika, and a drizzle of olive oil, and roast it at 420 degrees F for 20 minutes. Place it in a food processor with some sautéed garlic and a few tablespoons of butter, and blend it until it's creamy. For a carbohydrate crunch without the carbohydrates, look no further than this fatty treat. But don't think your options are limited to eating them straight out of the bag—not that there's anything wrong with that. Pork rinds are an excellent substitute for bread crumbs if you're pan-frying fish or chicken (thighs or drumsticks, of course). Just mix them with egg and parmesan cheese, and you're good to go! They serve the same function in 80/20 ground-beef meatloaf, all while giving you 9 grams of fat per 1-ounce serving. Yes, many condiments and dressings are sugar-laden and off-limits in the keto diet, but not all of them! Many are full of fat and absent of carbohydrates, which makes them a perfect way to keep you keto—and keep your food delicious. In the spreads and dressing department, consider mayo, garlic aioli, a cream-based dressing such as blue cheese or Caesar, sour cream, or guacamole. Commercial versions vary widely in their ingredients, of course, so give labels serious scrutiny. You can also indulge in many varieties of mustard (except honey mustard) and of hot sauces. Don't forget about fresh herbs and spices, too! Cinnamon in particular is perfect for a ketogenic diet. Not only can it help add a little sweetness to savory or creamy dishes, it may also play an important role in regulating blood sugar, which could mean that it can beneficially impact your health. Other herbs and spices are similarly well-suited to the ketogenic diet. Consider basil—or more specifically, pesto. In most recipes, there's nothing in it but basil, olive oil, walnuts or pine nuts, and parmesan cheese. That's about as keto-friendly as it gets. If you're passionate about the ketogenic diet and the health and physique benefits it can provide, great! But that's no reason to commit to someone else's version of the diet, especially if it ends up being unappetizing or boring to you. Match your nutrition to your tastes, and you'll set yourself up for success!